The partially blind man who became the most popular Bozo the Clown of all bluffed his way into the Marines during WWII. How? He passed the vision test by memorizing eye charts. Bob Bell wasn’t the only red-haired, red-nosed, floppy-shoed Bozo. 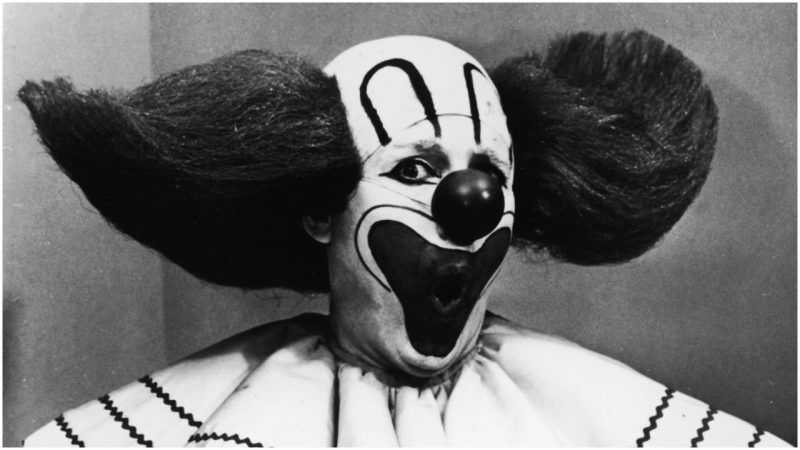 But as the star of Chicago’s WGN-TV Bozo’s Circus for 24 years, he was by far the most enduring and the most memorable. His show was carried in 182 markets during its peak in the late 1960s. Robert Lewis Bell was born in Flint, Michigan, in 1922, where his father, who’d played minor-league baseball, was an assembly worker at General Motors. During high school, he followed in his father’s footsteps and played baseball. But his compromised vision proved to be a barrier to professional sports. Young Bob moved west and took bit parts in movies like Arizona (he played an uncredited cavalryman). He also helped build the set of the Western city of Old Tucson, which became a major tourist attraction. In 1941 Bell decided to enlist in the Marines Corps, but with his partial blindness, he had to memorize the eye chart to pass. He didn’t last long in the Marines; within a year, he was discharged on medical leave. But that didn’t stop him from serving. He went on to join the Navy, where he served in the Pacific theater until 1946. After the war, Bell became a radio broadcaster in his hometown of Flint, moved on to other stations in Indiana and Ohio, and ultimately landed with Chicago’s WGN Television Channel 9, where he played comedic characters on The Wally Phillips Show and Midnight Ticker. He hosted the late 1950s afternoon showing of The 3 Stooges short subjects, on which he played the character of Andy Starr, venerable caretaker of the mythical Odeon Theater. At times he would also double in female impersonation as Mrs. Finstermacher, the owner of the Odeon. In 1959, WGN-TV invited Bell to portray Bozo the Clown on a live 30-minute afternoon show consisting of interstitial sketches and cartoons. By 1961, the show had evolved into an hour-long Bozo’s Circus. Like another famous red-haired clown, Bozo was a franchise. Alan W. Livingston created the character in the mid-1940s, and actor Pinto Colvig portrayed Bozo on an album that accompanied a children’s read-along book. 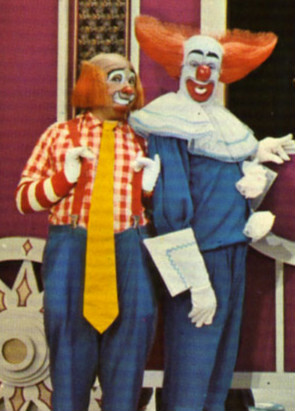 Colvig would go on to appear as Bozo on TV in 1949, making him the original broadcast Bozo. Actor Larry Harmon bought the rights to Bozo in 1956, and the franchise began, with Harmon licensing the character to dozens of TV stations around the country. Other actors to appear as Bozo in other TV markets included Willard Scott, who would go on to become the Today Show’s famous weather reporter. But it was Bob Bell’s Bozo who became the most famous. The Chicago station’s show was so popular that the waiting list for tickets to the taping stretched to a decade, prompting the station to quit taking reservations. On the day it took reservations again, five years’ worth of tickets sold out within five hours. The phone company reported more than 27 million calls had been attempted, according to the Associated Press. After Bell suffered an aneurysm in 1968, underwent surgery and took time to recuperate, he literally phoned his performance in, participating in the show over the telephone. In 1970, he received his first Emmy for his clowning and hosted Chicago’s Christmas Parade as the Grand Marshal. Bob Bell retired in 1984. 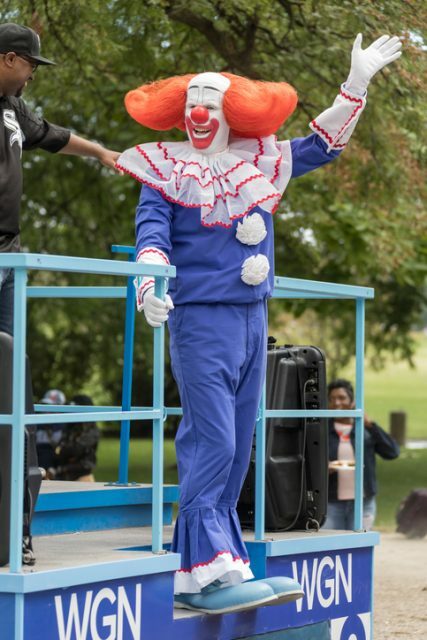 In 1996, when he was inducted into the Clown Hall of Fame (yes, there is such a thing), Larry Harmon refused to let him accept his award in a Bozo costume. Perhaps he was jealous of his clownish fame? Bell died one year later, in 1997, in Lake San Marcos, California. He was 75. This entry was posted in ART, History, USA, World by rolyred. Bookmark the permalink. i remember it like yesterday……like you said…ran home at noon to wach it……OH WERE HAS TIME GONE.